Accent your living room with this sleek contemporary chairside table. It has been designed with straight clean lines in a marvelous dark brown finish. Use the bottom shelf as a display surface for household collectibles and utilize the top of the table as a placeholder for drinks and snacks. Create a modern environment in your living room with this wonderful table. 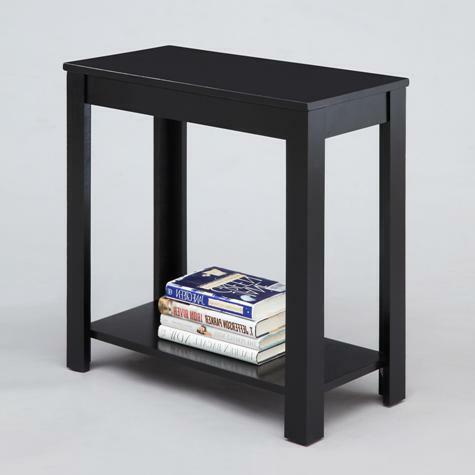 The Chairside Tables Contemporary Chairside Table with Bottom Shelf by Crown Mark at Sam Levitz Furniture in the Tucson, Oro Valley, Marana, Vail, and Green Valley, AZ area. Product availability may vary. Contact us for the most current availability on this product. Refresh your living room decor with one of these slick contemporary chairside tables. They feature neat straight lines that are representative of modern furnishing styles. Utilize these chairside tables as surfaces for snacks and drinks when watching the game or chatting with friends or as places to display household collectibles. Accent your living room with one of these wonderful tables. The Chairside Tables collection is a great option if you are looking for Contemporary furniture in the Tucson, Oro Valley, Marana, Vail, and Green Valley, AZ area. Browse other items in the Chairside Tables collection from Sam Levitz Furniture in the Tucson, Oro Valley, Marana, Vail, and Green Valley, AZ area.